I have totally discovered a new blog post theme for every post. HAHAH. After spending all morning trying to figure out my various health insurance options (OMG America, just put everyone on national health care already), I decided to cross the next item off on my to-do list: being a television extra. I’ve been thinking up things I want to do with my new unemployed/freelance time, including working on lots of my own projects, and doing weird fun things, one of which involved being an extra. I figured I had a leg up on everyone in New York because I have zero thespian aspirations* and can entertain myself during the long hours by knitting. (Figuring that being an extra is like dating–as long as you don’t want it, people want you. Also accomplished today: Watching He’s Just Not That Into You. Yep. I saw it. Shut up, I like Jennifer Aniston.) So I went to sign up for this and dude, it was totally like jury duty. A wide swath of New York’s most intense. So yes, if you are reading this on Wednesday, I will not be at my computer because I will be playing a blur (a wealthy art-appreciating blur!) on a very popular television show! (Hint: Police procedural.) Or, uh, knitting on a chair somewhere, waiting to play a blur. You might even see my sleeve on tv! * Of course, when I heard I got the “part,” I was totally excited, and imagining how they might upgrade me to a regular character, and how soon, even my friend Sarah would stalk me in Starbucks. Like everyone in America, I am revealed to be a fame whore when given even an inch. The rest of the day I was all cheerful–with this kind of luck, I should start buying lottery tickets and persuing my other schemes ASAP! Wait until the world hears about my awesome history book idea! ** I walked by the fashion tents at Bryant Park–it’s Fashion Week here in New York–and everyone was standing on the steps, craning their necks to see which models/fashion editors/celebs would come out of the Town Cars. I was so heartened. This is New York, where everyone comes to have their ridiculous dreams squashed! Yay! ** I mean, history, the most exciting field ever, right?! Posted in celebrity knitting, Uncategorized at February 18th, 2009. I was reading my September Vogue the other day, and I came across this article. 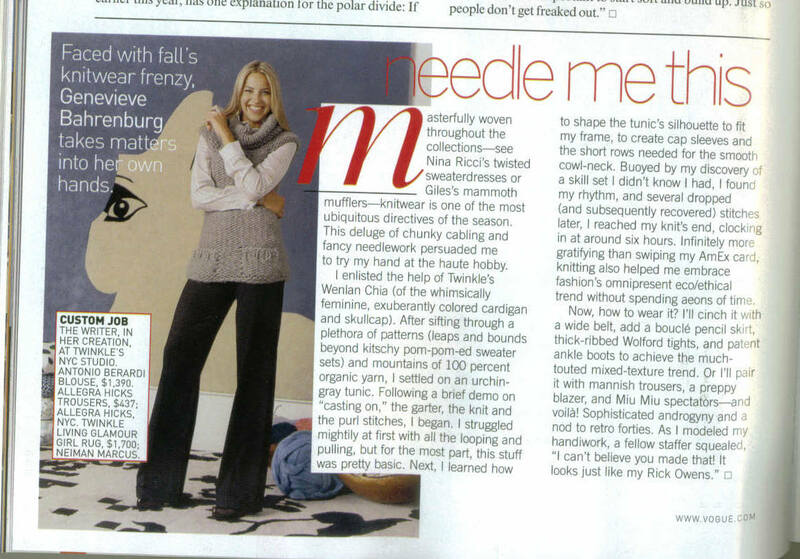 The author of the article goes to Wenlan Chia’s studio–and never having knit before!–knits herself this tunic. It’s pretty cute, actually, and it’s one of the patterns in Twinkle’s Big City’s Knits (which I own, and was planning on making some stuff from). There’s a whole flickr group devoted to Big City Knits here–pretty cute. In the fashion spreads of the same issue, there are also tons of GINORMOUS knits. Kind of crazy, and probably not all that wearable, but cute. Posted in celebrity knitting, Printed Matter, Uncategorized at September 3rd, 2007.